We hope your enjoying the projects so far! Day 2 brings more gorgeous inspiration from both teams! Be sure to check out the Authentique Blog for more Smitten Projects! Today we are sharing some layouts and tags created with Leaky Shed Studio Chipboard and Authentique's Smitten Collection. Remember to participate in our giveaway...the details are at the end of this post. Robbie used the Smitten collection in a different way by scrapping about Laynee's Dedication Day. 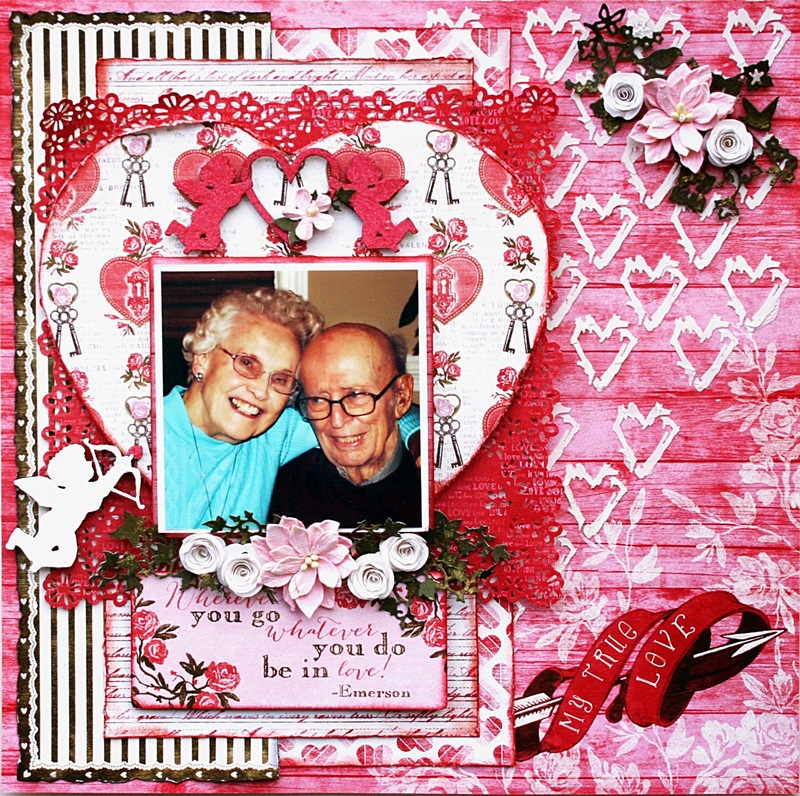 This layout is so sweet and don't you love those stitched hearts and little wooden hearts! 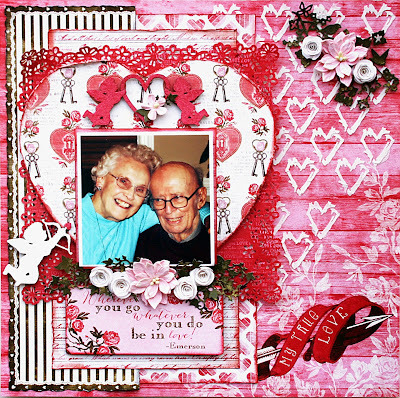 Maggi created a layout of her parents 70th wedding anniversary. They have shared many Valentines! Here is Maggi's process. I masked my base paper using a grunge heart mask. I layered several different papers from the Smitten collection and used cardboard between the layers to give my layout dimension. 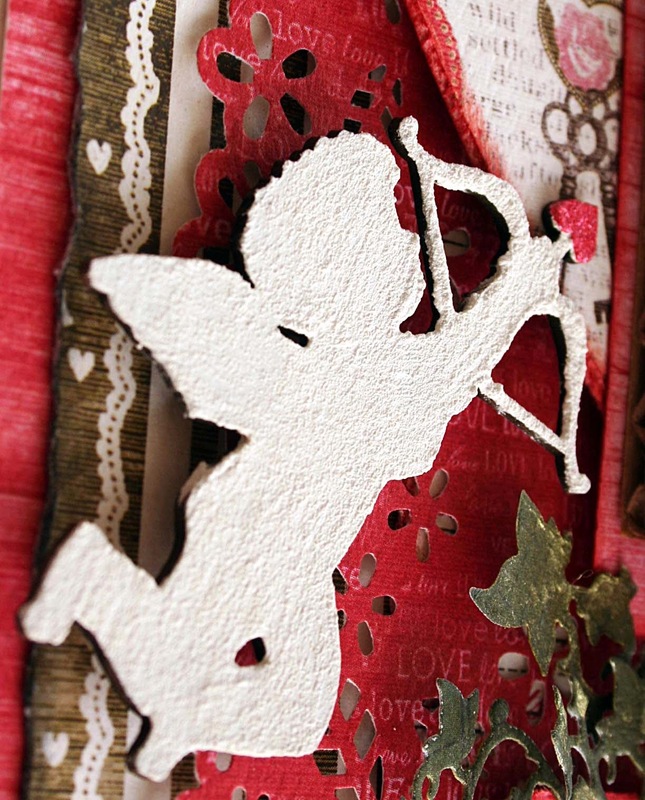 Over my photo I've placed our Leaky Shed Cherub's Heart and on the side is our Cupid firing his heart arrow. I've painted them both with Viva 3D stamp paint (carmine red and white). The Smitten collection includes lots of great quotes and I chose one to go underneath my photo. I love that Authentique's Smitten includes so many little cards with quotes on them. It makes it so easy to make a card or tag, or add a quote, as I did, to your layout. Next up is this fun tag that she giving her husband! Maggi's tags are usually irregularly shaped with things hanging off them and she likes to layer her tags. On this one, she layered the Double Hearts over our French Oval Frame and then I layered all that over a Spellbinders die cut oval frame. 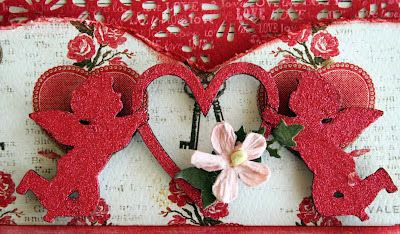 She treated both pieces of chipboard with Stampendous Embossing Enamels, Chunky White and Shabby Pink. Don't you love how embossing enamels give such a finished look to chipboard! 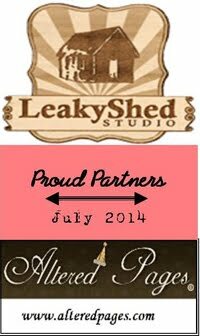 How would you like to win all of this Leaky Shed Studio Chipboard?!!! Follow us here and on Facebook. Easy Peasy! Hope you enjoys all these gorgeous projects today. If you haven't been to the Authentique blog yet, head over there for more inspiration from their design team and another giveaway! Love these projects and what a fabulous give-away!!! Thank you so much for the chance to win those awesome chippies!! These are all gorgeous!! LOVING all the hearts!!!!! I think the two product lines go great together. Such beautiful things-love the layout!! Thanks for doing a great giveaway!! I've been afraid to do much with the chipboard that I have on hand - wasn't sure how to treat it. I've gotten so many ideas from your blog. I'm glad I found you and I'll be back a lot. Love the projects. So bright and pretty. thanks for sharing. Oh I love your chipboard! The team is doing some really neat things with them. I adore the embossing enamel treatments! I really need to try that. Thanks for the wonderful inspiration! Ohw my Gosh how I would love to work with this beautiful Chipbord. Robbie and team did a fabulous job working with Authentique and Leaky Shed Studio. 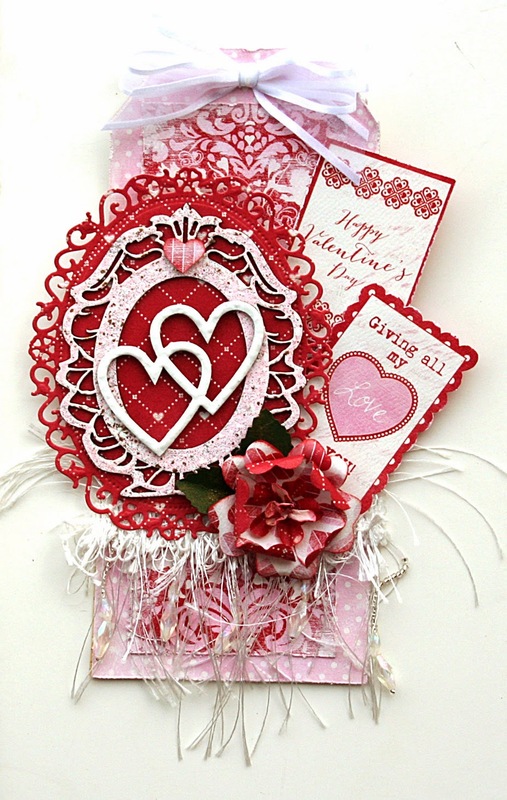 Loved the embossed chipbord such a fun idea. I'm allready a follower on Facebook and posted this on my own Facebook. Beautiufl projects...love the layouts, both so adorable (I already am a fan on facebook) and love the tag, it's a wonderful "piece of art"!! The chipboard is to die for!! OVER-THE-TOP GORGEOUS! Wow...what incredibly beautiful LOs! I am so glad I got acquainted with your company!!! Not all of your new readers have FB. Please consider opening your drawing up to blog commenters, too. Authentique always does that and it is VERY much appreciated by us non-FBers. Thanks!!! So pretty! Lots of great ideas and inspiration! Beautiful projects! Love the chipboard inspiration. Absolutely love these LO's! The sweet little wooden hearts are adorable! 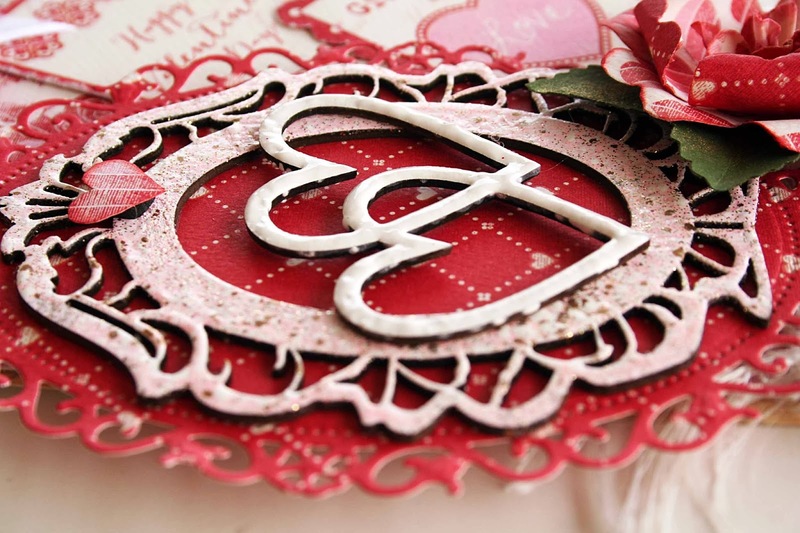 Love all the Valentine chipboard!! Would love to win this!! Became a follower here and already follow on FB! The striped paper is such a gorgeous background. Especially love that first layout. So sweet. SO MUCH LOVE in each project!!! I LOVE the DELIGHTFUL layers, dimension and textures!!! I almost missed this wonderful blog hop of inspiration having been away on vacation! Great job ladies! !